This is Reeve's second book since his devastating riding accident in May 1995, the first being Still Me in 1998. He starts off by telling us what it was like right after his unimaginable neck injury when he fell off his horse and broke his neck just centimeters below the brain stem. Having no "connection" between brain and body, he was fitted with a breathing tude and a feeding tube. All around him were doctors, specialists, nurses, and his adoring family. Thoughts of ending his life came to him but quickly went when his wife Dana, said to give the treatment two years and then see how he feels. Getting around in his now familiar custom-made wheelchair with the ever-present nurses and aids, Reeve was at least mobile. Humor was essential no matter how off-the-wall or cynical - laughter is good for you and he took full advantage of humor dished out by friends like Robin Williams. The book has quotes from speeches Reeve gave throughout this ime as he travelled across the country. It seemes as though he barely was still for a minute or two and then he was off again on some new project. He even directed "In the Gloaming" in 1996/97 and acted in Rear Window in 1998 and wrote Still Me. He attests his success to the mind over matter theory and how strong his mind was and how he believed he'd get better - at first he overcame infections and illnesses and almost had to have his leg amputated. All this while his life went on about him - he was still a parent and a husband. He tells how he encouraged his children in many activities and made a conscious effort to be a part of their young lives. The book covers his interest in stem cell research, getting bigger research grants, and extending the caps on insurance companies. He worked exceptionally hard, not only to better his own predicament, but for those already afflicted and for those to come. His and Dana's Paralysis Resource Center's web address is www.paralysis.org and the Christopher Reeve Paralysis Foundation web address is www.christopherreeve.org if you require further information. 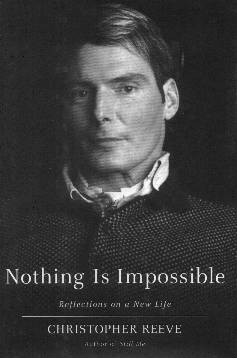 Christopher Reeve passed away in October 2004 at the age of 52. Conclusion - Inspiring and a great insight into this incredible human being's life. This book was not supplied by the publisher.